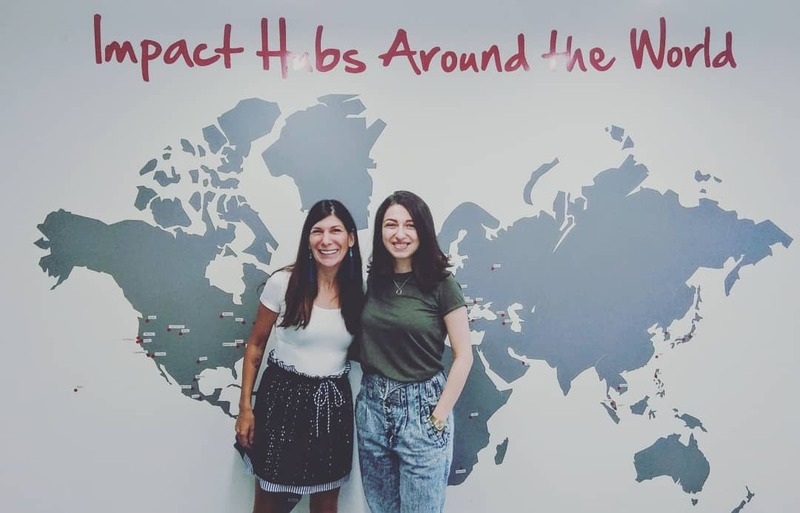 During my stay in Armenia, I had the chance to meet Anna Vasilyan, the Fellowship Program Manager from the Impact Hub Yerevan. Anna gave me a deep-dive into the startup scene in Armenia. The Impact Hub is a global network that builds and supports entrepreneurial communities with a focus on social impact and sustainability. There are more than 100 Hubs worldwide. All of them rely on the global Sustainable Development Goals (SDGs) within their activities. As a member, you can not only work from your local Hub but also visit the other global coworking spaces and profit from the huge network. What is your advice to people, who want to start their own business? Anna: The first advice is; know your WHY and understand your core values. Why do you want to become an entrepreneur? What is your motivation? All the decisions, which you will make as a founder are influenced by your values. To be aware of that relations will help you a lot on your entrepreneurial journey. The second advice is; never forget to focus on your customer’s needs. We all have great ideas. We believe that what we like is also what our potential customers will like, but this is often wrong. Always keep in mind, to talk to your customers to understand what they want. Fancy marketing will not make you successful if your product or service doesn’t match with your customer’s needs. My last advice is, be open for feedback and criticism. There are people out there with more experience than you. You can profit from their opinion. They already learned their lessons and possibly made mistakes. So look for mentors and ask for their feedback. And very important; never take criticism personally. How big is the startup scene in Armenia? Anna: We have a couple of ecosystem players. The sector is rapidly growing since we passed the new law about the tax break. That means startups are fully exempt from income tax during the first five years of operations. Since this law came out company registrations increased rapidly. There were already startups five years ago, but it was much harder due to the lack of a supportive ecosystem. Also, the universities started to offer programs like the Epic Lab of the American University of Yerevan. Bigger companies also realized that they have to invest in ideas and innovation. More and more Hackathons and corporations are now going on than a few years ago. How many members do you have at the Hub and in which sectors do they mainly operate? Anna: Since the Impact Hub Yerevan had opened its doors 2,5 years ago, the community is constantly growing. At the moment we have around 270 members, not only from Armenia but also from other countries like the US, Georgia or China. It is a good mix of people: There are freelancers, startup founders, VC members and also angel investors. There are mainly three sectors: (Bio) Agriculture, Tourism, and Tech. 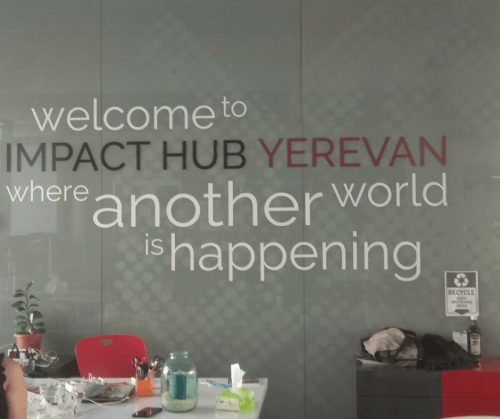 What is the purpose of the Impact Hub Yerevan? Anna: We offer our members amongst others a lot of interesting events, workshops, and so-called “sector stormings,” where startups can exchange ideas and support each other. We try to create a space for valuable discussions and knowledge sharing. 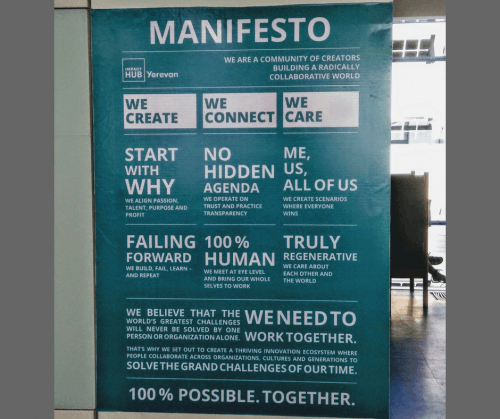 Impact Hub is much more than a regular coworking space. It is a safe environment to experiment, learn and grow. Besides that, we also run a couple of fellowship programs for example with the ACBA Federation, the owner of ACBA-Credit Agricole Bank. The Federation focuses on the development of the agriculture industry in Armenia. In the program, we support startups, which aim to solve agriculture issues with the help of technology. At the moment we have four program participants. One of them, e.g., has created a LED lamp, that accelerates the growth of the plant up to 40%. That is a lot. Another startup runs a project for processing aerial drone imagery. The drones fly over the field and check if a specific area needs more fertilizer or water. How does Artificial Intelligence (AI), IoT and sustainability fit together? Anna: Sustainability is getting more and more important in the area of AI and IoT. Soon everything will be connected. That is, on the one hand, a great thing, on the other hand, we need some good regulations. Impact Hub Yerevan, therefore, wants to make sure that Tech startups follow some ethics. We have a partnership with the United Nations Development Program (UNDP), where we help Tech startups to address one or more of the 17 sustainability development goals (SDG) within their projects. Natalie: Do you have an example? Anna: Sure! We worked, for example with an edge computing company, which makes connectivity between all devices possible. We approached the founders of this startup to promote themselves as an impacter with the aim to change the society positively, e.g., give connectivity to emerging countries like Africa. First, they were not convinced, but then they switched their language and the message. It was quite impressive to see that this little language change also shifted their mindset and internal culture completely. And now they are a real sustainable company from tip to toe. Do you have an example of an Impact Hub success story? Anna: There is a social enterprise called HDIF, which creates jobs in Armenia by supporting women in small villages and helping them to earn an extra income with their handcrafted products. The startup teaches the women business skills and offers distribution channels for the products. After HDIF started to sell the products to the US market, the sales figures went up rapidly. HDIF was so successful with their project that the team became too big for the Impact Hub co-working space. They moved out to their own office and also opened a shop in Yerevan. It is always sad to see people leave, but at the same time, it is fantastic to see the success. We are very proud of them. I heard there is a startup program for Diaspora Armenians. What is it about? 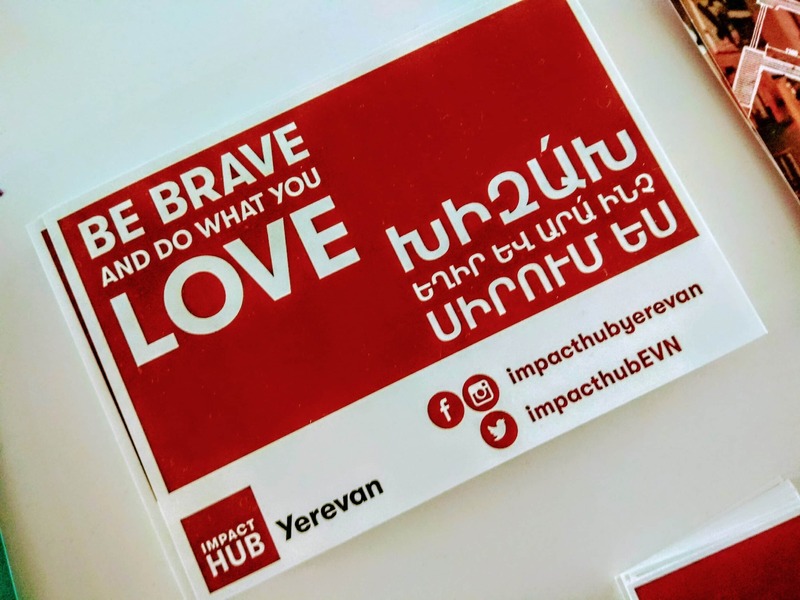 Anna: The program is called «NerUZH» and is initiated by Armenia’s Minister of Diaspora, Mkhitar Hayrapetyan in cooperation with Impact Hub Yerevan. It is an interactive program for young entrepreneurs between 18 and 35, with Armenian roots. The program aims to advance the participants knowledge base, help to expand their network, to receive funding and support them to enhance the startup ecosystem in the country. Natalie: Wow, that sound like an awesome project. I love the idea behind it. I think this is also a great opportunity for young Armenians in Switzerland and Germany. Can also non-members use your facilities? Anna: Yes, there is the possibility to buy a day-pass. It is around 10 dollar and gives you access to the co-working space and WiFi. Also, free coffee and tea are included. Natalie: That sounds like a great option for Digital Nomads visiting Armenia. Thanks for your time and insights, Anna. Do you have any questions about the interview? I’d love to hear from you.